This Sunday marks the 17th anniversary of the War in Afghanistan. Monday is Columbus Day/Indigenous People's Day. 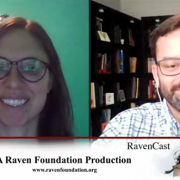 Lindsey Paris-Lopez and Adam Ericksen discuss how mimetic theory helps us understand the connections between these two days in the latest episode of the RavenCast! The violence of our times calls for a theology of resistance. Lindsey Paris-Lopez explains how Jesus gave us that theology in the Sermon on the Mount. Adam Ericksen recognizes mimetic rivalry at work in his hatred of Tom Brady, and yet admires one thing about him: he leaves God out of football. Why is this good? Because it can be all too tempting to believe God blesses the winners, but Jesus turns our understanding of God's blessing upside-down. The Presidential nominational is a carefully-crafted ritual, that, like other rituals, forges unity at another's expense. Lindsey Paris-Lopez observes that, "The DNC presented a false unity by quelling dissent and silencing victims. ... True unity cannot be built over and against others." Can we have a better conversation about abortion? Adam discusses that question in light of Donald Trump's recent statements - "Having a better conversation about these hot button issues begins by acknowledging that the other side is directed towards the good desire to protect potential victims. A better conversation continues with the fact that in a democracy, sometimes we have to make difficult choices about issues like abortion. But when we start by assuming the good intentions of the other side, we will refuse to demonize our opponents and we hold our positions with humility, grace, and mercy." "The truth about bin Laden's death is that it was murder," Suzanne Ross asserts. Perpetrator of violence are deceived; only victims know the truth. "I tend to bristle whenever politicians talks about American “exceptionalism,” but self-criticism is actually exceptional in human history." Adam Ericksen finds Christian value in President Obama's speech in Kenya about America's continuing struggle to perfect her union.